This plugin will add a tab on the user community builder profile that will display the VirtualMoney account page. 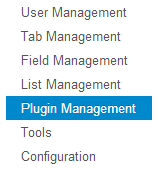 Please note that this plugin isn't a joomla plugin but a Community Builder plugin. Then select the zip folder containing the communitybuilder_virtualmoney_plugin and click Upload File & Install.